One of the first products of its kind in the world, DNA Diet tests for 20 genes that impact metabolism and exercise. The genes comprising the DNA Diet test have associations with body weight and body mass index, and all meet stringent criteria for utility in genetic screening tests. We provide a detailed report with recommendations that include dietary changes and an exercise programme. Genes involved in regulation of energy expenditure, appetite, and fat metabolism, all play an important role in weight regulation. In fact 40% to 80% of the variance in body weight is due to genetic factors. This helps to explain why not everyone gains or loses weight while following the same diet, despite being exposed to similar environments. Identifying an individual’s responsiveness to diet and lifestyle modification to control weight can be extremely advantageous. Genetics determines an individual’s susceptibility to obesity when exposed to an unfavourable environment. It also explores the way a person responds to diet and exercise. While healthy nutrition may in certain cases result in weight loss, this depends on many factors. 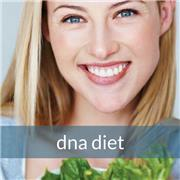 The DNA diet provides a tailor made nutrition and exercise programme. Healthy eating and exercise may result in weight loss, but this is not guaranteed. FABP2: Influences fat absorption and metabolism. PPARG: Involved in adipocyte differentiation. It is a transcription factor activated by fatty acids, and is also involved in the regulation of glucose and lipid metabolism. ADRB2: Involved in the mobilisation of fat from fat cells for energy, in response to catecholamines. APOA5: Plays an important role in regulation of plasma triglycerides. UCP1, UCP2, UCP3: Plays a role in weight control; if its difficut to lose weigth, if more intense excersise is needed. APOA2: An abundant apolipoprotein in HDL. Plays a complex role in lipoprotein metabolism, insulin resistance, obesity and atherosclerosis susceptibility. MC4R: A strong obesity candidate gene, significantly associated with energy intake and expenditure. FTO: Involved in the regulation of arousal, appetite, temperature, autonomic function and endocrine system. TCF7L2: Regulates blood glucose homeostasis, influencing both insulin secretion and sensitivity. ADBR3: Involved in the regulation of lypolysis that influences metabolism. CLOCK: An essential regulatory arm of the biological clock, involved in metabolic regulation. TNF-A: TNFα is a pro-inflammatory cytokine, secreted by both macrophages and adipocytes, which has been shown to alter whole body glucose homeostasis, and has been implicated in the development of obesity, obesity-related insulin resistance and dyslipidemia. TAS1R2: Believed to contribute to the inter-individual variation in sugar consumption. SLC2A2 (GLUT2): Influences the first step in glucose induced insulin secretion, affecting both food intake and regulation. DRD2: Midbrain dopamine circuits may play an important role in both addiction and normal eating behaviour as they are involved in reward processing, particularly dopaminergic signalling via dopamine receptor 2 (DRD2).